A clear leader in modern civil airplane design, Cirrus® Aircraft creations are as stylish as they are advanced. Their modern engineering methods offer performance conventionally-built aircraft can’t match, especially when combined with a premium level of comfort and functionality. The latest SR22T offers single-engine aircraft enthusiasts a contemporary and luxurious beauty true to its trend-setting heritage. 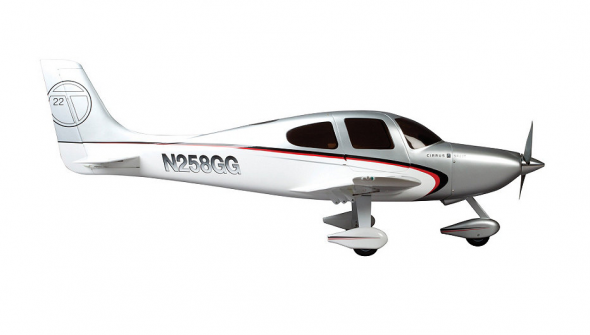 The Hangar 9® Cirrus® SR22T 30cc ARF is a officially licensed, giant-scale reproduction of this aviation star. With the modern civilian scale RC pilot in mind, this stylish IMAA legal model matches every refined curve as well as the character of the full-size airplane perfectly. The fiberglass fuselage construction and fully balsa-sheeted wings and control surfaces deliver amazing flight characteristics that are both smooth and stable. Additional convenience features, including removable doors for easy internal access, factory-located hinges, slotted flaps, plus an aluminum spinner, contribute to its scale accuracy and modern appeal. Both the recommended 33cc gas engine and electric power system easily mount inside the cowling, plus the high-quality hardware package is complete so that you can enjoy a distinctive civilian aircraft flight experience as soon as possible.